From time to time the supply of hotel metal from a blast furnace may exceed the demands of the steel plant, for example due to problems further downstream. In most integrated steel mills, the blast furnace plants are not equipped with pig casters, meaning that the excess hot metal has to be cast into an open air sand pit, a process known as "pooling" or "beaching." The ensuing dust and fumes constitute an environmental hazard and the resultant pool or beach iron takes a long time to solidify before it can be crushed into usable material. Granulation of the excess hot metal is a process that deals with these issues and produces a by-product - Granulated Pig Iron (GPI) - that can readily be used internally, for example as BOF coolant, or sold to third parties as feedstock for electric arc furnaces, cupolas and induction furnaces. Granulated Pig Iron (GPI) can be used, for example, as BOF coolant, or sold to third parties as feedstock for electric arc furnaces, cupolas and induction furnaces. GPI has the same chemical analysis as the source hot metal, with no slag contamination and minimal or no oxidation. 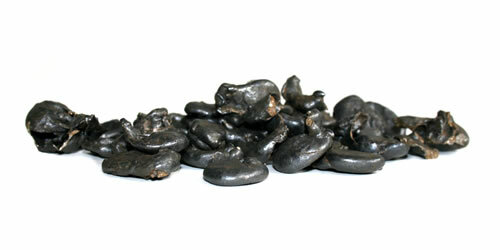 Typical analysis is 4-4.5 % carbon, 0.5-0.6 % silicon, and 94-95 % iron. Tramp elements (copper, nickel, molybdenum, and tin) are typically at a maximum of 0.05 %. GPI has a deformed spheroidal shape and has a high bulk density of around 4,000 kg/m3. The particle size of GPI is in the range of 5 mm to 25 mm. GPI has a high angle of repose, which allows for effective transport and storage. 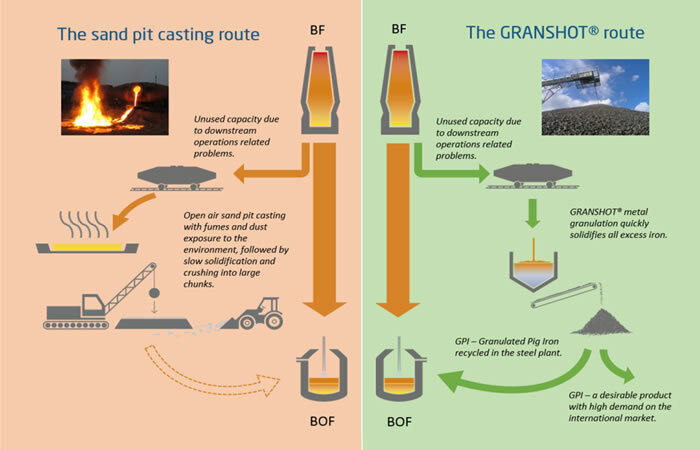 The diagram above compares the sandpit casting and granulation routes for dealing with excess hot metal, in this case the granulation process is the Granshot® process of IIMA member UHT Uvån Hagfors Teknologi AB. The video below shows pig iron granulation production using the Granshot® process. For the purposes of the International Maritime Organisation's International Maritime Solid Bulk Cargoes Code, GPI is included in a new schedule for "Iron Smelting By-products" and is classified as Group C (cargoes which are neither liable to liquefy nor possess chemical hazards).